from Herwig/Rhode "Geheimprojekte der Luftwaffe III"
The Ju268 was simply designed and constructed in wooden structures. The front nose was equipped with a socalled "Voreilzunder", which already was used on some Ju88 aircraft. The undercarriage was dropped after take off and was reusable. The main engines were BMW 003 or Jumo 004s plus 2 BMW 028 engines. 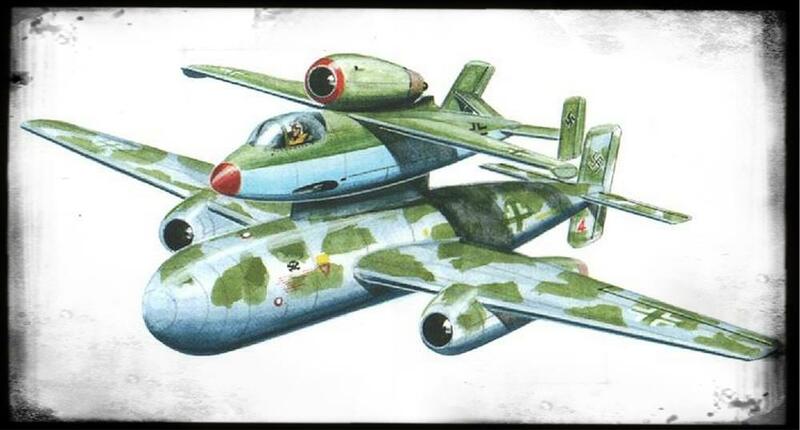 Alternate designs saw also the use of Messerschmitt Me262 as the carrier aircraft. A bomb payload of 10 tons should be loaded and a speed of 800km/h was projected. For Kamikaze missions a manned version of the Ju268 was under study as well with a glazed cockpit section in the front of the aircraft. The Ju268 was not built.